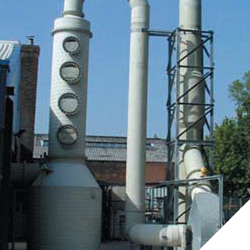 Enerjex 590 is an Alkaline based chemical which is used to "knock-out" the toxic NOx fumes which are generated during HOT acid pickling operations. The Enerjex 590 is added to the scrubber system so that it is circulated around the scrubber cascading from the distribution manifold down the packed column and reacting with the toxic fumes which are traveling in the opposite direction. The benefit of the Enerjex 590 is that the resulting compounds that are produced are soluble in the solution and therefore do not cling or cake the internal of the pipework and the impeller blades. This results in less maintenance work to clean the system.